Houston-Starr maintains custody from our warehouse to the jobsite providing the fastest lead-times in the industry. Mid-Atlantic service area lead-times are dependent on specific job requirements and size of project. 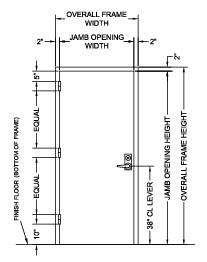 Wall Conditions The partition can be prebuilt using our split jamb frame. 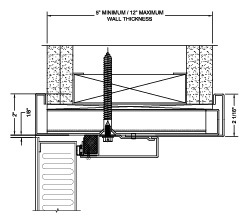 We are able to accommodate wall throat sizes ranging from 5” to 12”. Complete Opening Installation by Houston-Starr’s factory certified installation team allows your client to have a high quality install to ensuring your sound door assembly performs and your client can focus on their mission. Other Hardware Applications maybe available upon special request. Please install wood blocking inside the steel stud to allow for the wood lag screws to anchor correctly to the partition. 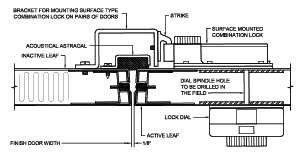 Please make sure your floor is level to allow for the bottom door seal to operate correctly. This door cannot be installed on a raised floor, a partition must be built underneath the opening to support the weight of your door and frame assembly. Please make sure that your paint is fully cured before coming in contact with the sound seals. Typically latex paints take at least 30 days to fully cure. Please check with your paint manufacturer for your specific curing time. Please make sure not to paint any of the seal or hardware on the STC door. Painting the seals will damage the gasketing and could impact your acoustical performance. Disclaimer: Houston-Starr is only providing general guidelines for construction of your partition as it relates to STC door installation. It is the responsibility of your drywall partition installer to properly design and build your partitions. Houston-Starr accepts no responsibility for partition design, engineering or installation. All lead-times are subject to the availability of stock material.